Welcome to the webpage for The King’s Friends, a key feature of the Georgian Papers Programme designed for researchers. The King’s Friends is a free-to-join international community of those whose work stands to benefit from the digitization of the Georgian papers in the Royal Archives, and who in turn can help make the project a success. We hope that, as a researcher working on eighteenth-century or early nineteenth-century themes, you will join the King’s Friends network, and that you will find it of use and interest. What follows offers a brief introduction both to the programme and to the King’s Friends. How do I join the King’s Friends? What sort of material is the GPP making available to researchers? So, how do I know if the GPP holds anything of interest to me? The Georgian Papers Programme will best succeed by encouraging and supporting a productive dialogue between researchers and the project teams. Indeed part of the rationale of and excitement around the Programme — in addition to the process of digitizing the Georgian papers themselves — is to develop a new model of good practice for such a capacious project. Our aim is that the processes of digitisation, transcription, display and interpretation of the documents that are being made available will proceed in a way which makes them mutually informing and supportive. To do this, we need to work closely together — as academics or other researchers, librarians, archivists, or technical staff in order to ensure that the end result is flexible enough to meet the needs and requirements of a wide variety of users. The King’s Friends network has been established to help make this a reality. Named (with tongue firmly in cheek!) 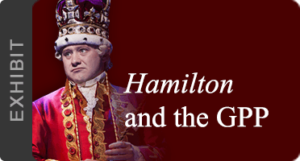 after the political grouping which mobilized behind monarchical interests in the Hanoverian House of Commons under George III, we hope this will become a significant network for any researcher who might anticipate finding material of interest in the Royal Archives. The King’s Friends, we note, will bring together a much wider variety of participants than George III might have imagined, thus realizing another ambition of the Programme, which is to engage an expansive and diverse research community. Access ahead of publication to digitised materials that might be of value to your researches, with the opportunity to blog about your research and its significance when the materials are made publicly available. Access to the expertise of the core team and the Royal Archives staff concerning whether there might be other material of relevance to your research. Advance notice of events and funding/research opportunities in association with the programme. Opportunities to propose events/research initiatives in collaboration with the programme or to seek its support. Opportunities to discuss the cataloguing and description of archives in advance of their digitization. Opportunities to exchange ideas and resources with other members and the project team. Opportunities to take on and help lead work on resources which may be central to advancing your research interests, for example as transcription platforms support crowd-sourced or student transcription initiatives. Not all Friends will take equal advantage of all these benefits of membership, but we believe that by making them available we will provide a genuinely useful service to the research community while the project teams stand to gain invaluable advice and guidance from our users. For example, it will help us identify experts to whom we might turn to advice when the core team identify especially striking or puzzling materials in the archive, especially in that vast majority of papers that have not been fully explored hitherto, and in the process alert researchers to exciting and unexpected opportunities. Experience to date suggests that the kind of dialogue we hope to foster can provide researchers with important new leads and direction in their research which in other circumstances might have come too late or never have come to their attention. We also anticipate that the network will identify other opportunities and services that might be of mutual benefit to the programme and its users, and we will make every effort to respond to this. Joining the King’s Friends is simple. Fill out the short form HERE, which asks for your name, affiliation to an academic or related institution, your email address, and a short description of your interests that are relevant to the project, and for academics or those with personal webpages, a link to any website that gives a more general description of your scholarly interests. We will not share this information beyond the project teams without your permission, although ideally we would also like to encourage the Friends to use the network to identify others with similar interests. It will be entirely up to you whether or not you choose to share contact information with the network as a whole. All Friends will be able to login to a dedicated section of the GPP website where this material will appear. We look forward to welcoming you to the King’s Friends, so that you can join us on what promises to be an exciting research adventure. To receive updates please sign up / join as a member of King’s Friends here. If you are already a member you can login to access the members’ area. Launched in 2015, the Georgian Papers Programme, is a ten-year interdisciplinary project to digitise, conserve, catalogue, transcribe, interpret and disseminate 425,000 pages or 65,000 items in the Royal Archives and Royal Library relating to the Georgian period, 1714-1837. The ultimate goal of the Programme is to provide a unique digital resource which is both readily accessible to members of the public and capable of sophisticated manipulation by researchers in any discipline, and to offer academic and public programming representing fresh research and interpretation. The GPP documents are made available at http://gpp.royalcollection.org.uk/. An additional website hosts commentary and other resources: georgianpapersprogramme.com. This site reflects the academic and curatorial work that is shared among the GPP partners on both sides of the Atlantic. One key aim of the GPP is self-evidently to create digital resources for scholarship on this period; but it is very important to emphasise that it is equally committed to supporting and enabling such scholarship in accessing and engaging with these materials, as well as driving research from within the programme. The royal archives for this period are rich and varied. 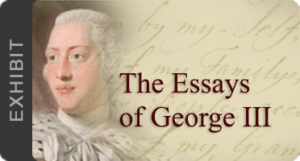 Probably the most familiar element is the correspondence of George III and George IV, the basis for important 20th-century printed editions and a key resource for historians of both domestic and international British politics in this period. But there are also collections of correspondence and papers relating to many other members of the royal family; to members of the court; draft memoirs; medical and scientific papers; papers relating to royal collections (such as the royal library and art), music at the court and beyond, agriculture, religion, and all the various and significant fields in which the British monarchy took an interest as patron, practitioner or audience (and in the case of medicine as patient). There are also accounts and other material relating to the running of the royal household and court; including the education of the royal children and provisioning and housing of the court. This means that the archive contains a remarkable range of material of interest not just to historians of all aspects of eighteenth-century Britain, but also materials of vital interest to those studying other parts of the world – notably the histories of North America and the eighteenth-century Anglo Atlantic world– and those working in fields such as literature, historical geography, musicology and international relations. Even in the field of political history, and of the role of the monarch in politics, where there are existing editions of correspondence, these are often inaccurate in transcription or dating, or incomplete. The GPP will become the most authoritative resource for these materials. So, how do I know if the GPP hold anything of interest to me? It is likely that the GPP will support creative research into most aspects of 18th-century history. The GPP offers a variety of fellowship opportunities for scholars, and the work of the fellows has demonstrated the rich variety of subjects that can be explored through the Georgian Papers. As in any varied collection, researchers will find materials to support unexpected analyses and narratives. An estimated 15% of the Georgian Papers have previously been published, but these editions are variable in quality and reliability for scholarly purposes. One aim of the GPP is to make available much more robust search tools and transcription. These are challenging tasks, however, and will take time and resources; a planning grant from the National Endowment for the Humanities supported orting initial work. While this work proceeds, one aim of the King’s Friends is to assist users in identifying relevant material in the interim.